Formed over centuries by shifting glaciers, the fjord landscape consists of giant peaks that descend into deep valleys with crystal clear waters. This is more than a stunning backdrop – it is almost like the mountains were tailor-made for ski touring. The steep Sunnmøre Alps, not far from the coast and surrounding the Hjørundfjord, provides many exciting possibilities. The region boasts six of the top ten Norwegian ski tours as voted by the Norwegian Mountain Guides Association. You can for example ski from 1,500 metres above sea level down to the fjord in one run. The Sunnmøre Alps is just a short drive from the Art Nouveau town of Ålesund, so there is also the option of combining your ski tour with a stay in one of Norway's most charming towns. You can also stay in Norway’s second biggest city Bergen, located on the southwestern coast. A UNESCO world heritage with medieval roots, Bergen offers a convenient base with easy access both to life in the city and to the fjords. Ski touring at Mt. Hoven. Fjord skiing at Norde Sætretind. 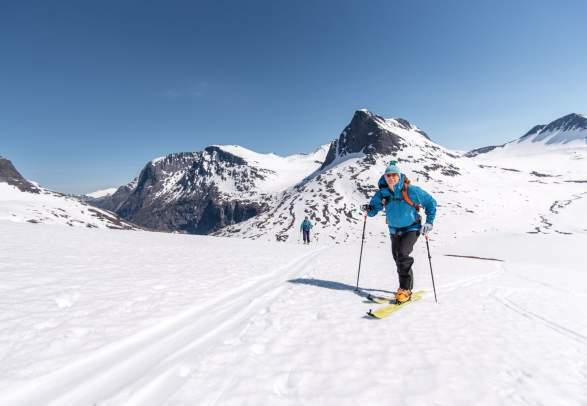 Ski touring at the Geirangerfjord.